ATLANTA — Jered Weaver pitched against all but one of the possible major league opponents during his 11 seasons with the Los Angeles Angels. Weaver allowed two bases-empty home runs but just one other hit in six innings. He didn’t issue a walk while striking out five before being pulled for a pinch hitter. 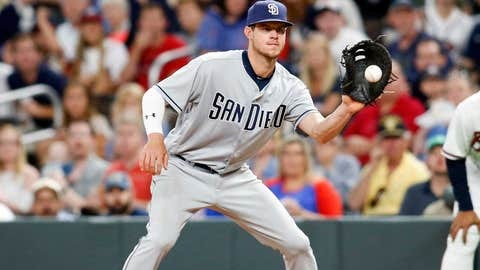 “He was impressive in Colorado,” Padres manager Andy Green said. “That’s a tough place to pitch. He made two mistakes, but he pitched the way he always has to be successful. Garcia (0-1, 5.73 ERA) hasn’t won since last August, going 0-6 with a 7.60 ERA in his past eight starts, but he fared well against the Padres while with St. Louis. Weaver wasn’t sharp in his first outing for the Padres, giving up two homers at Los Angeles as the Dodgers won 10-2. He bounced back against the Rockies, though.